The window of opportunity to foraging many wild plants is short. Catch them in their growing season and you have a meal or medicine. Once they’re gone, you’ll have to wait several months to enjoy their benefits. Not so with trees. They don’t wither in late autumn and disappear. Understand their properties as a valuable year-round resource, trees become indispensable to for outdoor self-reliance. We’ve discussed a few trees found in Georgia offering nutrition, medicinal, and other benefits. 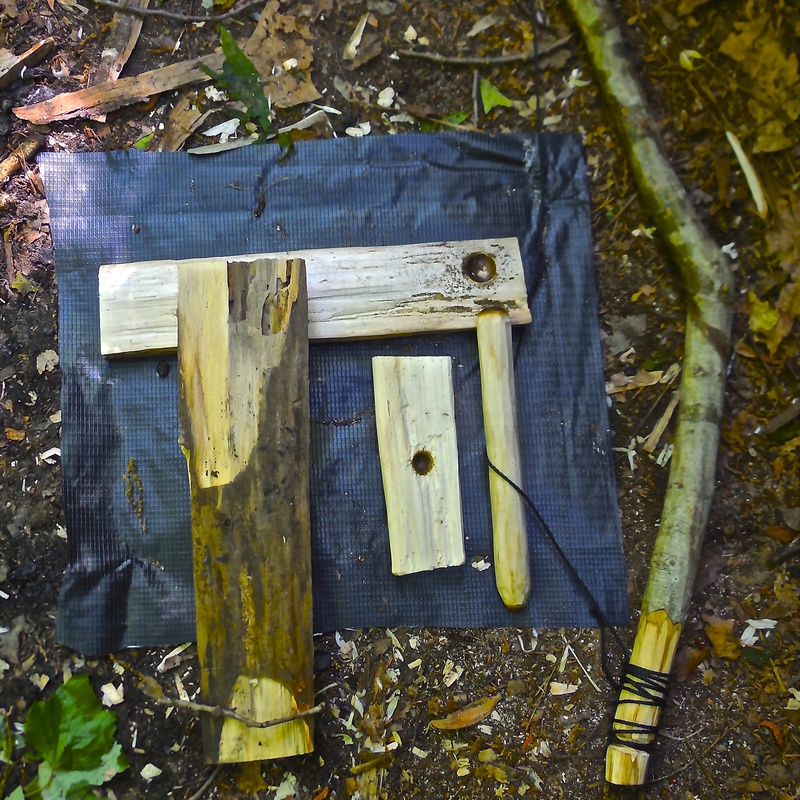 Check out the Trees for Self-Reliance tab at the top of this page for further research on useful eastern woodland trees and projects made from them. The tulip poplar is actually not a in the Poplar family. Early North American settlers thought this tree was related to the European white poplar, which are members of the Willow (Salicaceae) family. Nope. The Tulip Poplar is actually in the Magnolia (Magnoliaceae) family – flowering plant family. Other common names include yellow poplar, tulip tree, yellow wood, and canoe wood. Some names I’d never heard before are saddle tree, lyre tree, and old wife’s shirt. I’m guessing the leaves resembled an old wife’s shirt to some early settler?? Come to think of it, they do remind me of a T-shirt. No matter what you call this tree, tulip poplars are easy to identify in any season and contain rich resources for woodsman, homesteaders, and outdoor adventurers. One of the tallest and most distinct in the eastern woodland, tulip poplars grow to heights of 120 feet (or more) with straight limb-less trunks until they reach a narrow crown. Large 2 inch orange, green, and yellow cup-shaped flowers appear in mid spring (in middle to north Georgia) resembling tulips flowers. The leaves are quite unusual in appearance, nearly square (4 to 6 inches long) with 4 to 6 paired lobes on long stalks which wave in the slightest breeze. Drink the honey-like nectar straight from the flower cup if you find any hanging low… cheers! Even in winter, long after their leaves have turned yellow and littered the forest floor, one can spot these trees easily. 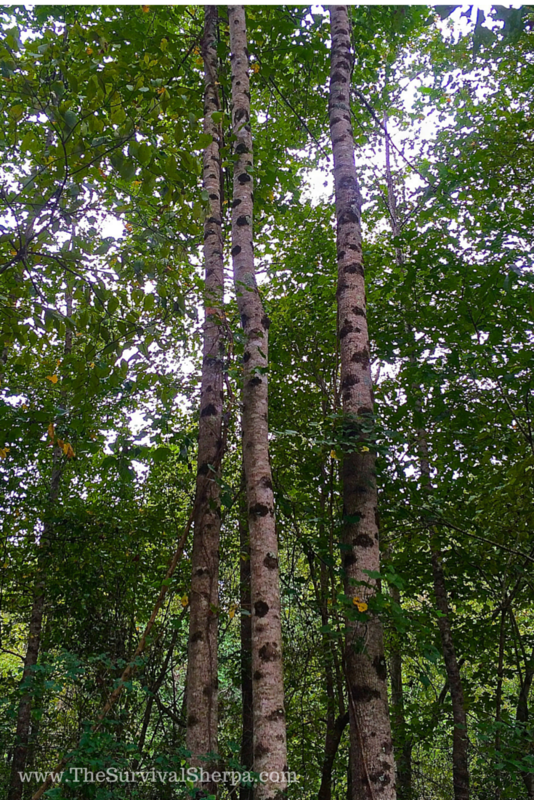 In a race to the top of the forest canopy, this fast growing hardwood drops its lower limbs leaving dark scars resembling scattered “black eyes” along the length of the gray trunk. Before dropping, the bark of dead limbs often peel revealing a whitish colored wood which contrasts well in darker winter landscapes. You can find these trees ranging from Ontario to northern Florida and west through Mississippi. They like well-drained soil in moist valleys and ridges. Whether making primitive fire by friction or using your Bic lighter, locate a tulip poplar and you’ll likely find dry, dead limbs near the base. I often run across clumps of poplar trees with the smallest tree standing dead. Harvest it for the wood and inner bark to assist your fire craft. 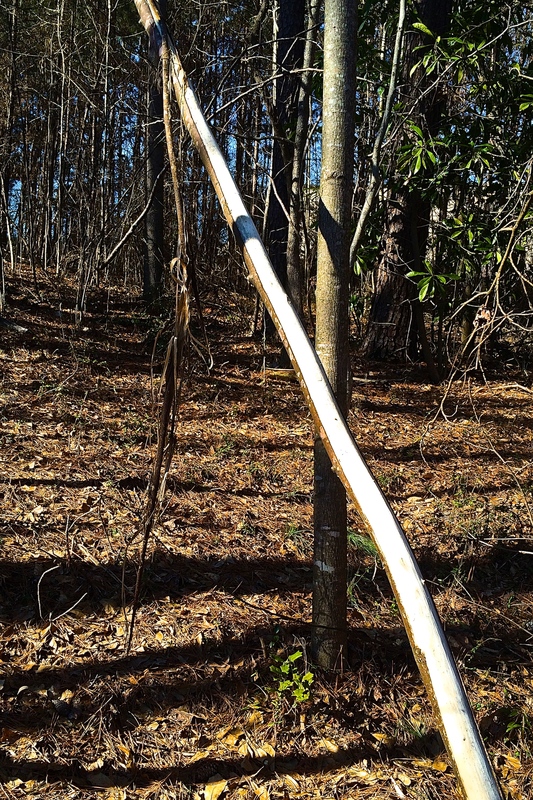 One 2-3 inch x 12 inch dead limb of tulip poplar, bark intact, may be all you have but is all you need to build a sustainable fire. 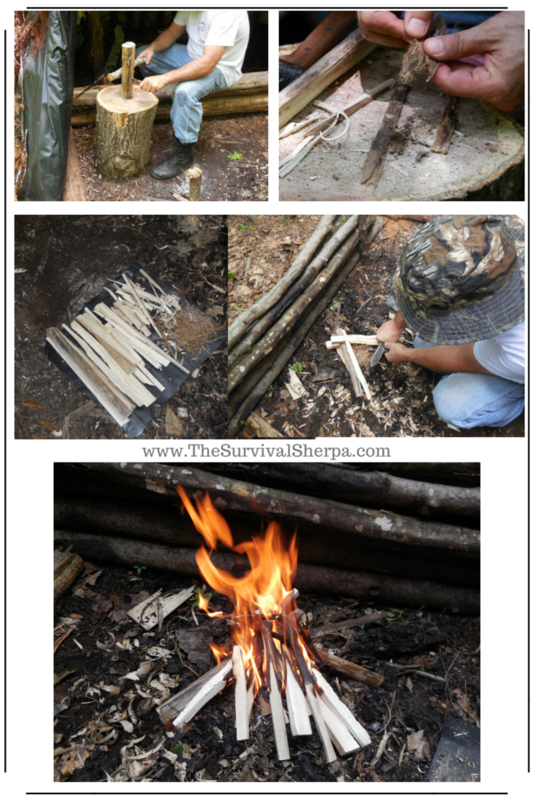 Process the inner bark into fine hair-like fibers to form a tinder bundle. Split the wood down into pencil-lead, pencil, and thumb sizes. If dry, the inner fibers will ignite with sparks from a ferro rod. Use your Bic on marginally dry tinder. If you need coals for cooking or “burn and scrape” woodcraft projects, choose another wood like oak or hickory. I’ve found tulip poplar doesn’t make coals but burns to ash. Once you and a tree collaborate to make primitive fire, there’s a primal rush that pulses through your being… You’ll never be the same! 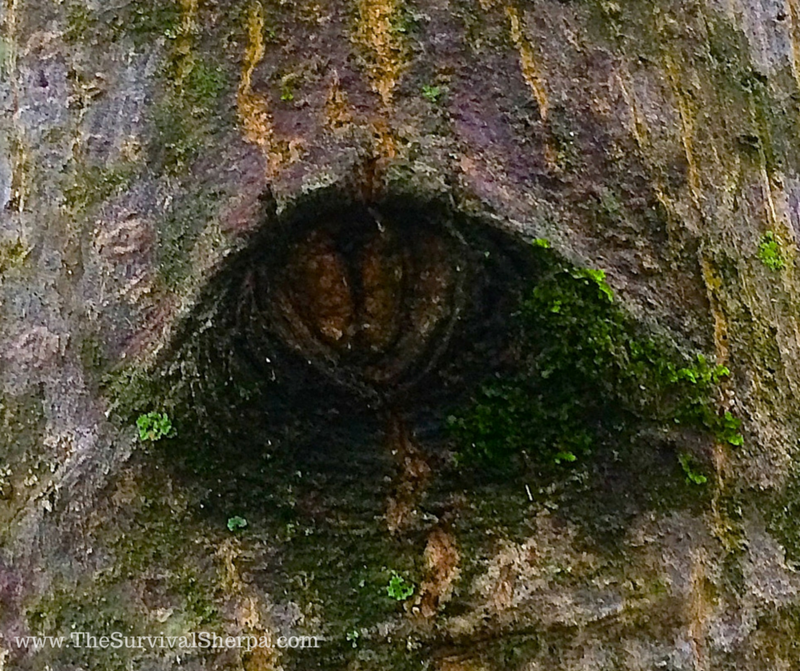 You may not plan on being without this vital C of Survivability, but if you are, the inner bark of tulip poplar can be twisted into fine to large rope. 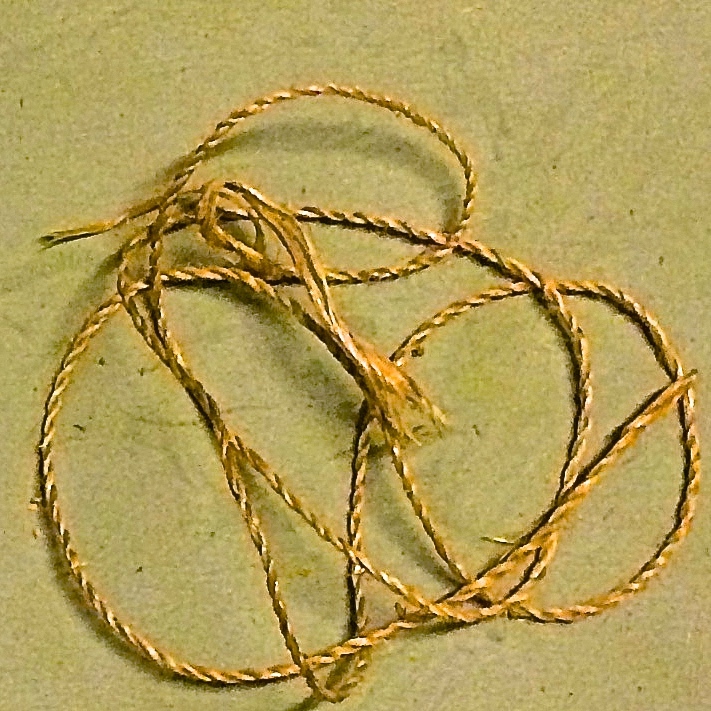 Natural cordage isn’t that difficult to reproduce from the landscape. It just takes time, resources, and skill… which is why you should always carry stuff to lash and tie things together. Self-aid should be your top priority on wilderness outings. Even if you manage to avoid stupid stuff, accidents happen. In late spring, the bark of the tulip poplar is ripe for harvesting. Baskets, arrow quivers, and other containers can be crafted from the outer bark. Simply score the bark with a saw or knife to the sap wood, split the bark vertically, and peel the bark off the log in a whole section. 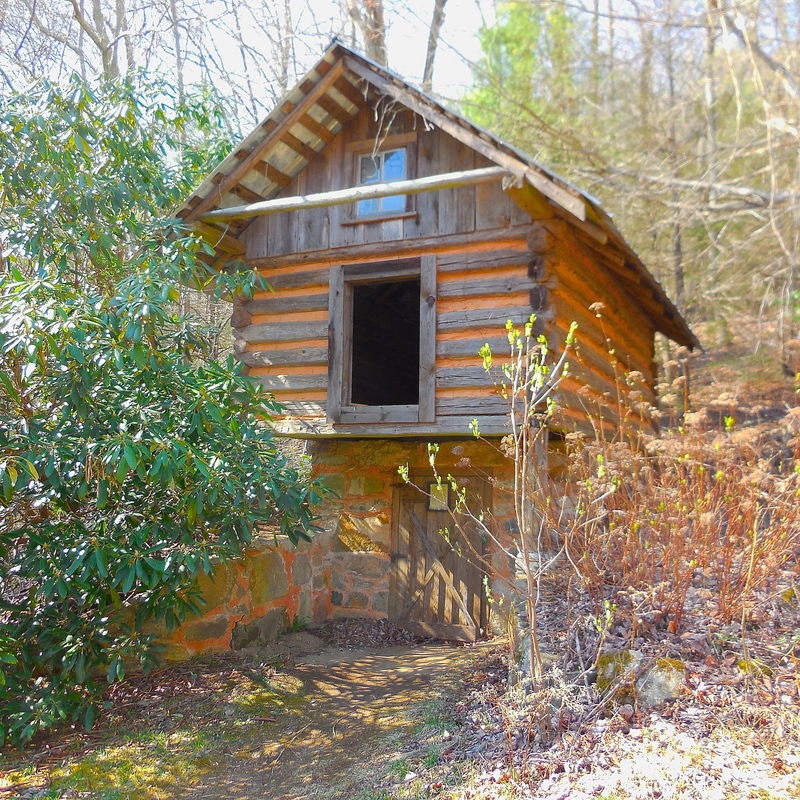 The Foxfire Museum in North Georgia showcases the pioneer culture of Southern Appalachia with displays of cabins, barns, and out buildings built from long, straight tulip poplar trees. DRG and I have visited the museum on two occasions to admire the self-reliant skills needed to sustain their way of life. 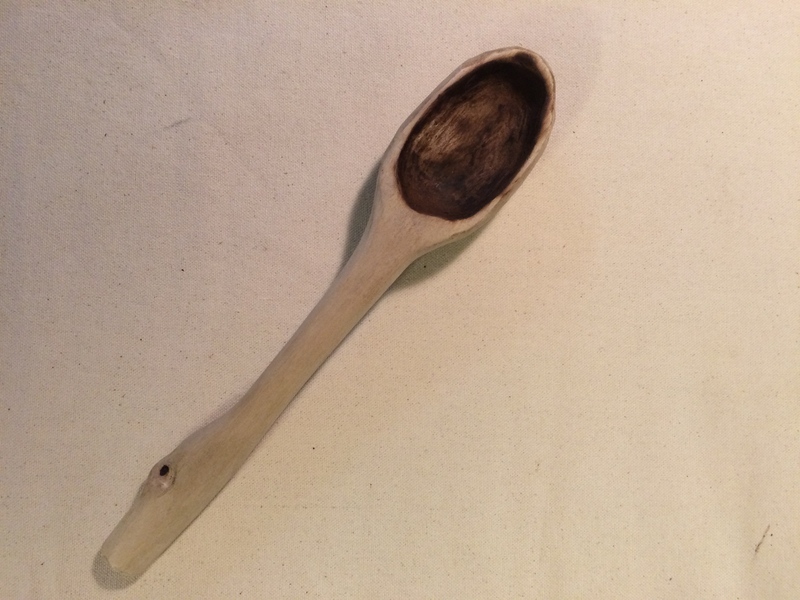 In woodcraft/bushcraft, tulip poplar is a good selection for spoon carving, pottery paddles, and even dugout canoes. History tells us that Native Americans made canoes of this tree. Daniel Boone is said to have made and used a tulip poplar canoe. 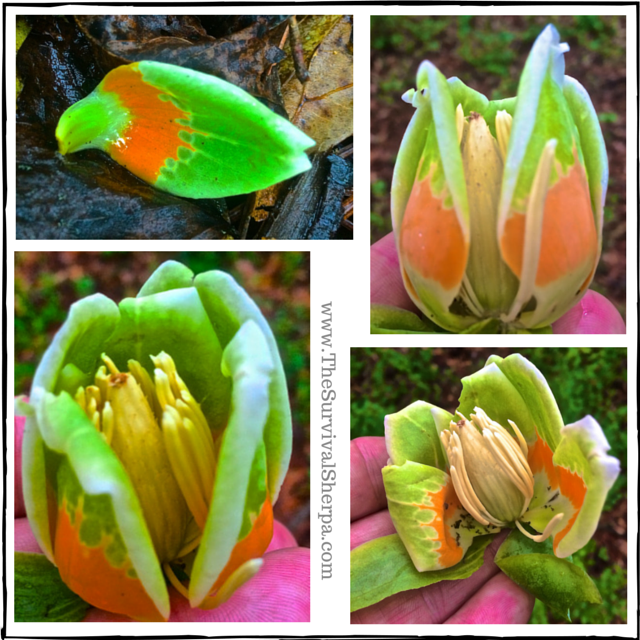 One of the highlights of spring foraging is the sweet, honey-like nectar found in the cup of tulip poplar blooms. As mentioned previously, mature trees drop their lower branches which makes finding low-hanging blooms a challenge. Your best bet at sipping this delicacy is locating a tree in someone’s yard. In my experience, yard trees have lots of lower branches still attached since they aren’t competing with other trees to reach the top of the forest canopy. If you’re fortunate enough to find one in reach, pluck the bloom and drink the nectar straight from the cup. You’ll be in competition with the local squirrels though – so get to them early! 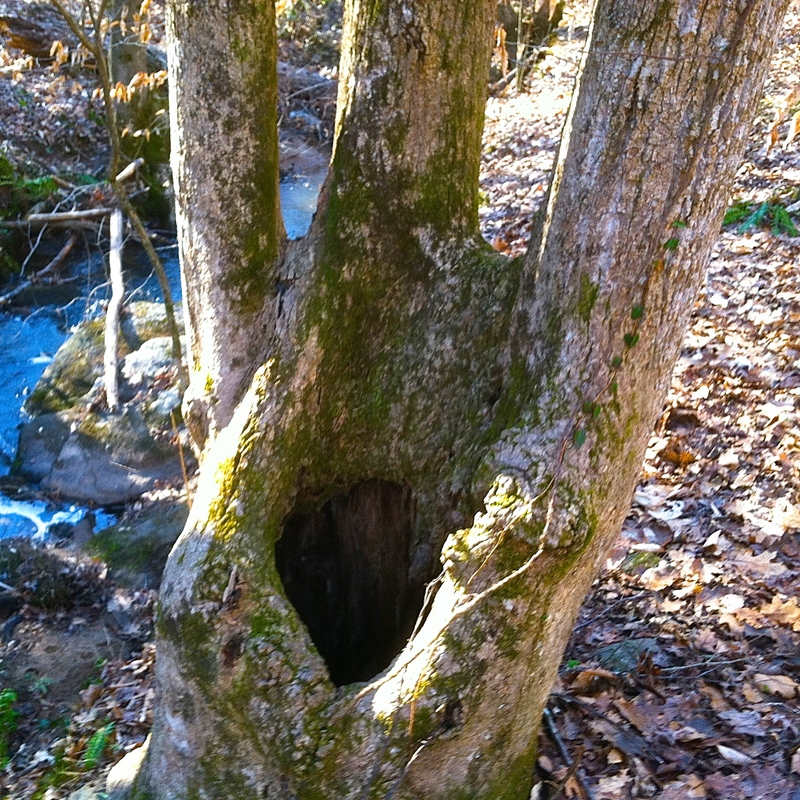 I’ll leave you with an image of an interesting triple tulip poplar near my shelter. love all the stuff you share! Great job!! Why thanks, Hon! Appreciate you stopping by and commenting. Talk to you soon. What beautiful trees. Alas, they don’t grow in Australia! Sorry to hear that, Cook. 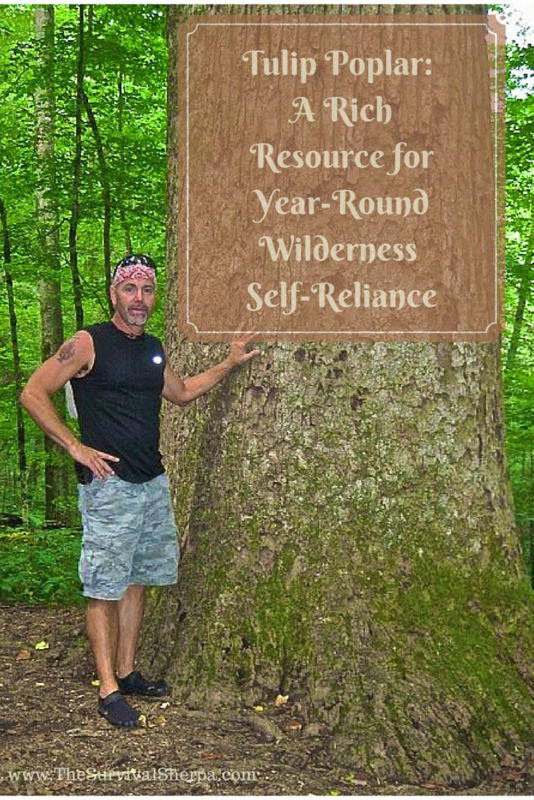 The key to self-reliance is finding resources specific to your area. I’d love to visit other places to find out how you folks down under do the stuff. Thanks for your comment! Very few people in Australia would have the skills to survive in the bush for more than a few days. It’s a tough environment. 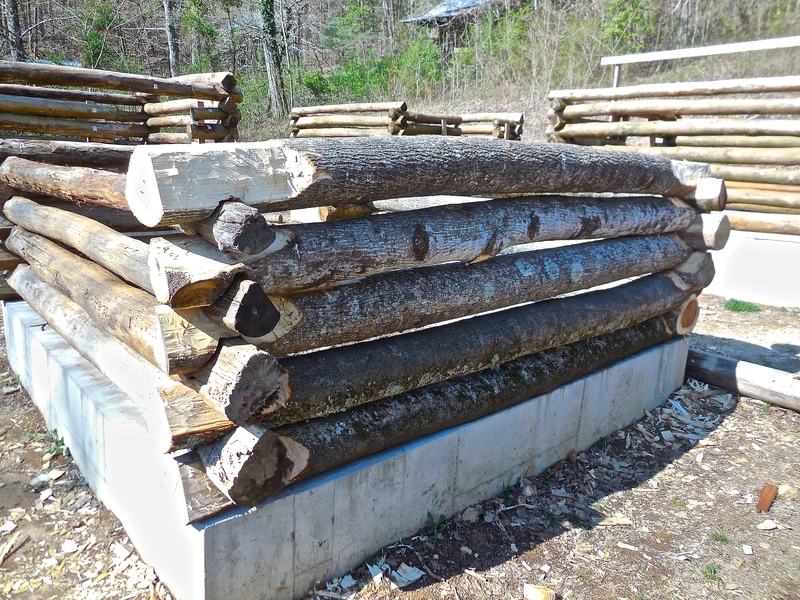 Pingback: Five poplars, two weeks, and a portable sawmill | What was it? ?